Japan has always developed cars that are in budget of the many, apart from the LFA, NSX, GT-R, Skyline, Sylvia, Supra, and now comes the car built called Subieyota due to the collaboration between Subaru and Toyota on its development. The BRZ STI has stirred the automotive world alot as fans and foes as well await its actual launch and delivery because what the video below in this post displays is exactly why a war between Porsche and Nissan broke. While Subaru is promising everyone a car with low-weight, great handling and pure driving pleasure however, the video shows the BRZ STI is mounted with a large inter-cooler and a Turbo. 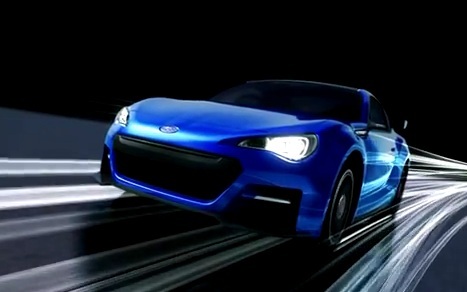 The full production version of the BRZ sportscar will look much like this with the exception of the go-faster bits when it debuts at the 2011 Tokyo Motor Show, but we’re really hoping STI will get in on the action and see that demand is there for a 300 hp version. Right now, the power you can expect from the BRZ is a bit over 210 hp from the brand new 2.0-liter flat-four that comes with Toyota’s D-4S port and direct injection technology. A six-speed manual powering the rear wheels, but it’s not clear right now if they’re also going to fit an automatic.